People think something seriously fishy is afoot with this video which claims to show a mermaid getting dragged out of a lake. 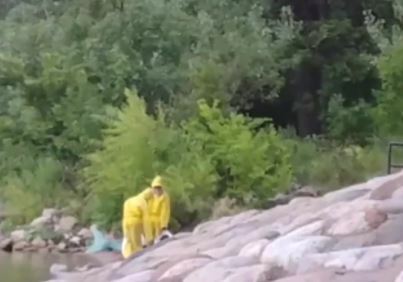 The footage was shot in Minnesota, and purports to show a couple of anonymous government workers dragging a dead creature out of a lake. 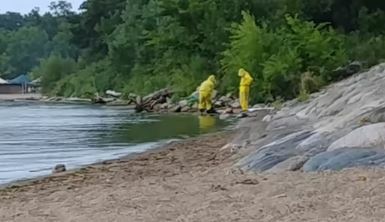 The men in yellow suits walk into the water and pull out an indiscernible creature which people seem to think looks suspiciously like a mermaid. The creature appears dead, or at least knocked out, as one of the men in yellow suits arranges a net or a bag to put the creature in. 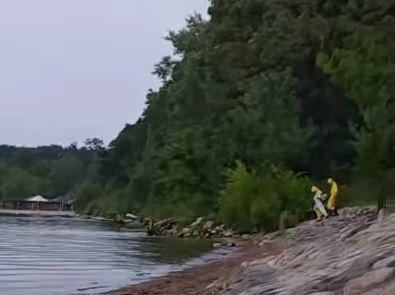 In the four minute video, the man who is shooting the video can be seen visibly shaking as he tries to capture the best angle of what’s happening at the edge of the water. As the men deal with the net, they lay the creature down on the shore and the camera gets a better look at the ‘tail’ of the mermaid, and what looks like a fin as it lays lifeless on the ground. The footage was sent in to YouTube site Paranormal Elite, who posted the video three days ago. 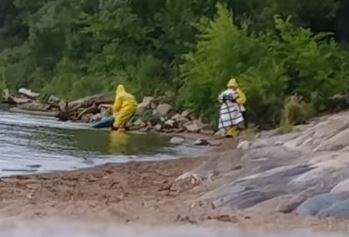 This footage was filmed by a man on a beach in Minnesota. The lake in which the video was filmed at remains unknown as well as the man’s identity. He wishes to only go by Macky. We at Paranormal Elite were sent the footage from Macky, who took it on his cell phone camera. He claims that the park was first cleared, and then big vehicles came in with people wearing yellow hazmat suits. Macky stayed behind and filmed despite the park’s efforts to get everyone out. The post goes on to claim that ‘Macky’ is actually not from Minnesota but from Australia and was on holiday – where they decided to go to a local park. Paranormal Elite describe the events in the video saying ‘the creature seen bears striking resemblance to the mermaids depicted in fictional stories’. ‘Macky’ has also heard rumour of humanoid creatures with tails which resemble that of a fish in his native Australia, but was surprised to see this being pulled out of a fresh water lake. It remains a mystery whether or not mermaids do inhabit lakes in Minnesota. After all, what happens when the lakes freeze in the winter? This isn’t the first sighting of strange underwater creatures in recent months, with the sighting of an odd underwater creature in June. 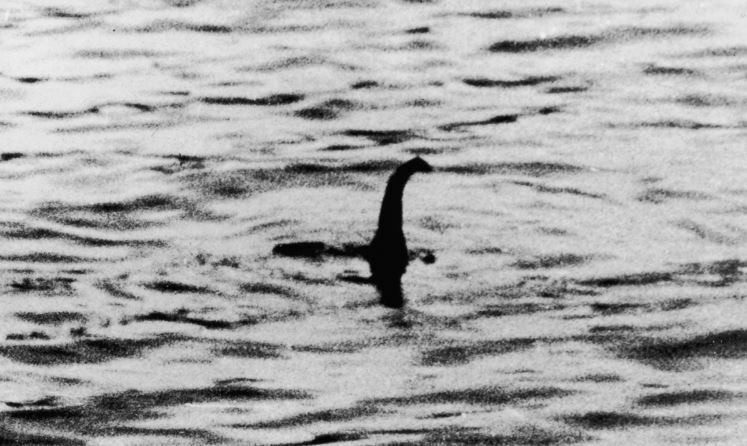 The sighting of what looked like The Loch Ness Monster was sighted in Russia, leading some people to claim that Nessie had a Russian cousin. The sighting of the fabled creature includes an image which shows the trademark elongated neck and little hump not far behind. The image bears a striking resemblance to other sightings of Nessie in the titular Loch Ness in Scotland. Even if these sightings aren’t real, it’s still fun to have a look and wonder at the mysterious side of the world, it’s what makes life interesting. Mermaids might not be, but Bigfoot is definitely real.